Whether you’re partial to chicken noodle, beef & Tomato, or tortellini minestrone, we have a healthy & fresh soup recipe for you. Don’t let the extra effort keep you from trying these tasty treats! Today we have rounded up 31 Healthy & Fresh soup recipes that you can easily make at home that the entire family will enjoy! 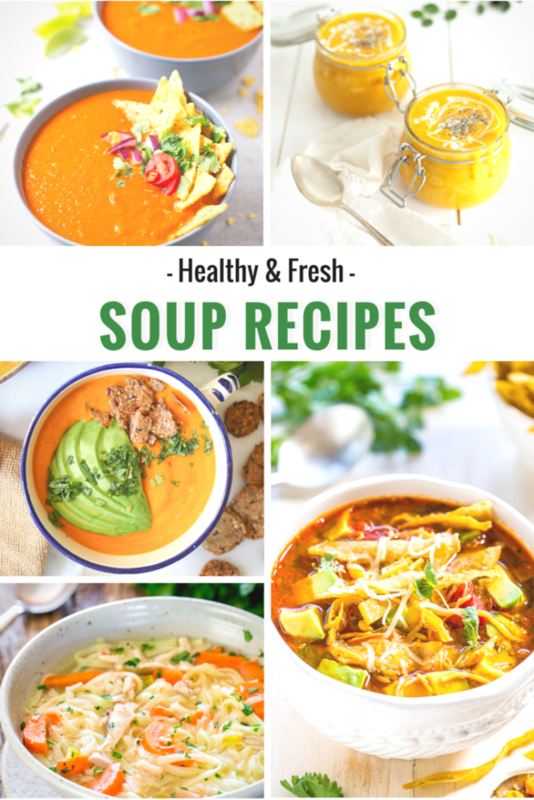 We all know homemade soup is better for you because you know exactly what’s in it and there are so many new and interesting flavours on this list there is something here for everyone! So grab a spoon and dig in…. 4.) Chicken tortilla via Averie cooks. I hope these 31 delicious Healthy & fresh soup recipes will warm you up and inspired you to try something new. I had no idea there were so many different choices to choose from. Did you? I can’t think of anything better than curling up by a roaring fire with a great new book and a steaming bowl of fresh tomato soup can you? Perfect way to beat the heat this summer and keep your house cool. So, Which Healthy & Fresh soup recipes was your favourite? Is there another recipe that we would totally love and forgot to add to the list? I would love to hear about it in the comments below. This is such a great list! My kids have their sport activities in the evenings and we love to do soups because a lot of times they can be thrown in the slow cooker. Thanks for all of these options! It is so hard to find a good vegetable soup recipe. I love that you put all these together for us. YAY! This list is right on time. I love soups in the summer. Will be making a few of these! These all sound really good! I love fresh recipes, and these all sound really good for summer. What a great round up of soup recipes. I’ll be sure to try them in the fall when the weather gets cooler. These sound like awesome soup recipes indeed. I would love to try making the Thai coconut pumpkin soup which sounds so delicious and interesting for sure. Soups are great for a healthy meal. Thanks for sharing the recipes. I love soup and enjoy it most days for lunch. I can’t wait to try these ones. This list is a great list of soup recipes, I will have to try some of them. Thanks for sharing such an extensive list! I love soup but I will admit I usually stick to the same old recipes time and time again. I will definitely give some of these a try! I love finding new soup recipes. Soup and salad or soup and a half sandwich is my favorite light lunch. I would love to try the Thai Coconut Pumpkin soup. It sounds so flavorful and satisfying. I am definitely making soup some time this week. I’m saving this post. I don’t make soups very often, but I want to. I’ve really been wanting to try to make some type of tortilla soup, so I’ll be checking that one out. I love to make soup. I make a big batch and then freeze it into smaller batches so I always have it ready to go, all I have to do is defrost it. These are some great recipes. I am totally pinning this blog post! I am looking for healthy ways to eat but also creative ways because it’s boring to you the same thing over and over again. Oh, these sound good. I’ve been on a soup kick recently. I love finding healthy options. YUM! This is an awesome list – I LOVE soup! I’m already planning to make the lasagna soup and tortilla soup this week now! Soup is one of my favorite foods and I eat soup all year round. All of these soups look delicious and I see a few that I want to try ASAP. I love enjoying soups, especially when I’m sick. All of these look so delicious! I’d love to try the Thai Coconut one. It sounds so exotic and tasty! I love soups like these. I think that Garlic soup sounds so good! I can’t wait to try that one. Some of these look absolutely delicious! I don’t make nearly enough soups, but it’s such a great meal idea. I’ll have to pin and remember a few of these. Wow! Now that’s a soup list! Thanks for making it a one stop shop for a bunch of yummy and healthy soups! Soup is one of my favorite things to make for dinner, just add some crusty bread and everyone is happy! I can’t wait to try a few of these! This post is making me hungry, especially for soup! They all sound so delicious, thank you for a round-up, they make finding new recipes easy!